Here’s an overview of the Reshaping Community Services work being carried out in Newham, in the South Community Recovery team, one of the first pilot teams in this Quality Improvement priority area. As part of their project, the team were aiming to improve the satisfaction with care provided by staff and received by service users. A project team was formed with a range of staff and service users, who met weekly to drive the work forward. One of the first things the project team did was to create a driver diagram, to help them articulate a strategy to help meet their aim. This had a range of different change ideas on it, however one of the main ideas they tested was the development of co-production workshops held by staff and service users. 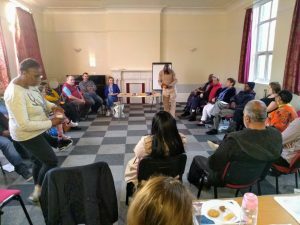 The aim of these was to provide an opportunity for staff and service users to come together to meaningfully have conversations about the service and what good looks like.